Last night our group of Stampin Up! 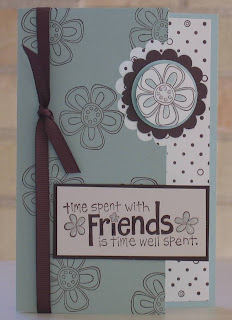 demonstrators in the Riverina got together to share stamping ideas and and have a evening of fun! So that we can all build up our card samples to take to workshops I set a challenge that the swap needed to be a card using one of the hostess sets from the from 2008 catalogue. This is what I cam up with using the Level 3 hostess stamp set Time Well Spent. Accessories: Scallop punch, 3.5cm and 3.2 cm Circle punches, dazzling diamonds and a 2 way gel pen. Hi Nice Blog .The detailed spine anatomy , for example, of the bronchial tree as seen through the bronchoscope is now of great importance. The introduction of laparoscopic and thoracoscopic instruments to explore and operate in the abdomen and thorax respectively has also opened new vistas as surgeons require to learn their anatomical landmarks through these approaches.